I’m in Belize right now getting reacquainted with some old friends and nemeses. One big frustration in birding down here is that bird diversity in the tropics seems to have exhausted the descriptive powers of pioneering tropical naturalists. Ant-tanagers, for example. 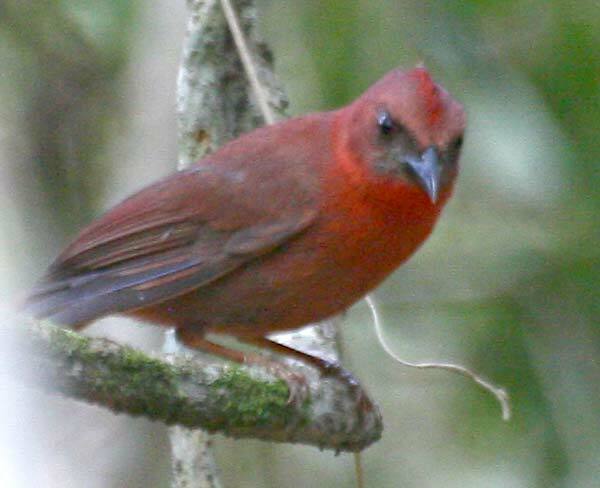 There are two species in Belize: Red-crowned and Red-throated. Their shared last name is informative, as they’re related to and resemble the more familiar Summer, Scarlet, and Hepatic tanagers, and they follow army ant swarms. If you thought their first names might be equally helpful, however, you couldn’t be more wrong. The male Red-crowned also has a red throat, and the male Red-throated (shown above) also has a red crown. The females have neither red crowns nor red throats, of course. One way to tell males of the two species apart is by the color of their faces. In the Red-crowned, the area between the eye and the base of the bill—the lores—is red, while in the Red-throated the lores are dark. Why not change at least one of the names to reflect this distinction? It’s not like it would be the first time a bird was named for an obscure bit of anatomy (Black-vented Oriole? Crissal Thrasher?) or even after its lores (there’s a whole slew of examples). “Dark-lored Ant-Tanager” might not completely end the confusion, but at least it would be a more entertaining kind of confusion (for Star Wars geeks, anyway).